Tahoe Truckee Outdoor: Who killed Sunny the bear? Who killed Sunny the bear? 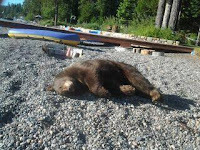 On the morning of July 30, 2012, the body of a bear was found on the beach in Homewood. Closer inspection by the Department of Fish and Game (DFG) revealed the bear had been shot. This bear wasn’t just any bear. Her name was “Sunny”, a regular visitor to the area. Before the shooting, Homewood’s “Bear League” was trying to educate people about bears, so they could protect themselves from Sunny. The Bear League called Sunny a gentle and sweet bear. A few days before Sunny was killed, an angry resident made it known to the Bear League that he was a hunter and would shoot Sunny if he came around his property. DFG took the body of Sunny to a forensics lab in Rancho Cordova and launched an investigation into the shooting. That investigation is ongoing. The Bear League is convinced that the self proclaimed hunter who threatened Sunny is responsible. The Bear League posted the man’s name and address on their Facebook page the day after the shooting. The name and address were also posted on the Facebook page: Lake Tahoe Wall of Shame. 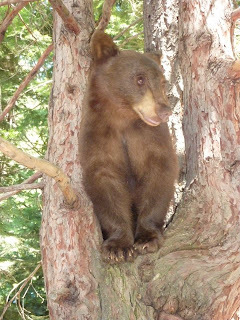 This page shares comments and photos of people or businesses that threaten bear safety. In less than a week there was a $2,000 dollar reward for leads to the shooter‘s identity. That reward has now risen to $15,000 dollars. DFG said the man suspected of shooting Sunny has refused to give a statement and they have no evidence to connect him to the shooting. The investigation is open, but at a standstill. The Bear League will not rest until someone is charged and convicted for what the league calls, the “murder” of Sunny.